Comments: Individual variations and two color morphs make it difficult to differentiate among the three jaegers. Pomarine Jaegers are larger, have a heavier, barrel-chested appearance and broader and longer wings than other jaegers. Although usually lost soon after leaving their arctic breeding grounds, the two central tail feathers are broad, blunt, have a halftwist and extend beyond the rest of the tail. On breeding grounds their main food is lemmings. 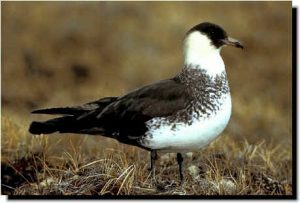 Pomarine Jaegers occur in small numbers or are found only in localized sites within the Great Plains.